Boris Johnson has finally apologized to the family of a British mother being detained in Iran for any “anguish” he may have caused when he made false remarks about her reason for traveling. It is feared the gaffe may result in her jail term being lengthened. Johnson told the Foreign Affairs Committee that Nazanin Zaghari-Ratcliffe had been training journalists in Iran, when in fact she was on holiday visiting family members. Three days after he made the comments, she was taken unexpectedly before a court and accused of “spreading propaganda against the regime.” She was arrested last year over alleged involvement in a coup. Speaking in the House of Commons on Monday, he said the British government has no doubt she was on holiday. The comment comes after Johnson’s buddy, Environment Secretary Michael Gove, appeared on the BBC on Sunday claiming he “did not know” why she was there. Johnson said he would be traveling to Iran later in the year to “review the full state of our relations and to drive home the state of feelings about this case.” He said the British government has taken “every opportunity” to raise the case with Iranian officials. The British government said on Monday it’s doing all it can to secure the release of Zaghari-Ratcliffe, who is “on the verge of a nervous breakdown” in an Iranian jail. This is despite accusations of Gove and Johnson exacerbating her plight. Prime Minister Theresa May’s spokesperson said May has spoken to President Hassan Rouhani at least twice regarding the mother’s detention, and said the government was doing “everything it can” to have her freed. 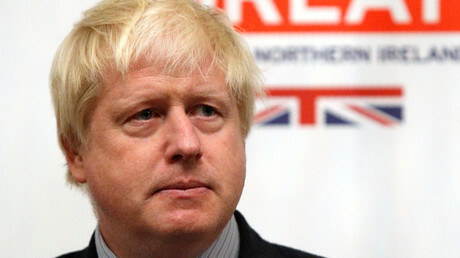 Her husband, Richard Ratcliffe, said he spoke to Johnson on Sunday. The foreign secretary apparently failed to apologize to him for the comments. Ratcliffe is urging Johnson to take him along on a potential trip to Iran, and to visit his wife in prison to “send a very clear message” that she should be released. Ratcliffe said it would improve her chances of being freed, according to the BBC. Johnson has also received an application from Ratcliffe for “diplomatic protection” in a bid to give her more support. The government says it is considering this. Zaghari-Ratcliffe, from Hampstead, has not been visited by anyone from the UK since she was jailed in Iran’s Evin prison 19 months ago. Ratcliffe has warned that his wife is on the “verge of a nervous breakdown” and is “falling apart” over the “shambles” her case has become. He said he was increasingly concerned for her health, as she complained of sharp, stabbing pains in her breasts for some months, and on Saturday was taken to a Tehran hospital after discovering lumps. As Johnson faces continuing pressure over remarks he made about Zaghari-Ratcliffe, Gove, the environment secretary, tried to use a BBC interview to come to the foreign secretary’s defense. Gove was asked what he thought the woman was doing in Iran at the time. He responded with “I don’t know,” adding there was “no reason Nazanin Zaghari-Ratcliffe should be in prison in Iran so far as any of us know.” He went on to say her husband was the person who would know, and he would take his assurance she was on holiday. Labour has accused Gove of being “more interested in protecting [Boris Johnson’s] job” than Zaghari-Ratcliffe’s liberty. Jon Trickett, shadow Cabinet Office minister, said Gove had “compounded” Johnson’s “cavalier approach to international diplomacy,” according to the Financial Times.